A World War II veteran who is the last-known living Buffalo-area resident to have served in a segregated unit has received six long-overdue medals. 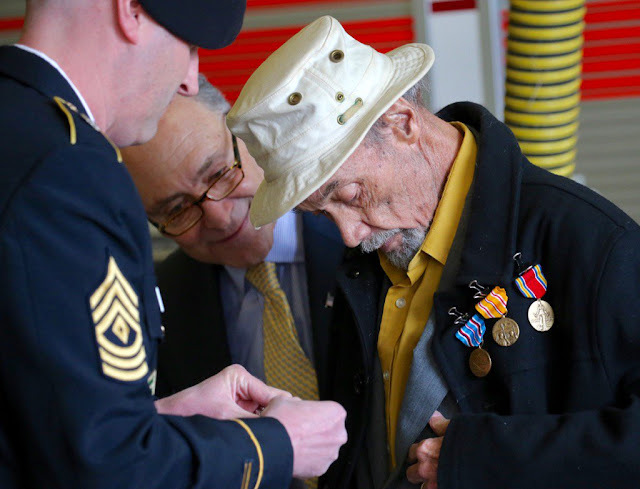 U.S. Senate Minority Leader Charles Schumer and Rep. Brian Higgins, a Buffalo Democrat, presented George Watts with the medals during a ceremony Wednesday at a city fire station. Watts was a sergeant assigned to an all-black Army engineer unit that served in the Philippines campaign. He was honorably discharged in 1946. Two years later President Harry Truman integrated the U.S. military. Among the belated decorations Watts received was the Asiatic-Pacific Campaign Medal and the World War II Victory medal. Schumer and Higgins say racism likely kept Watts and many other black soldiers from receiving the military honors they earned with their service during the war.